The Duke Power Company, now known as Duke Energy, created Lake Norman in 1963 to harness hydroelectric power. Since then, they have built the Marshall Steam Station and the McGuire Nuclear Plant. 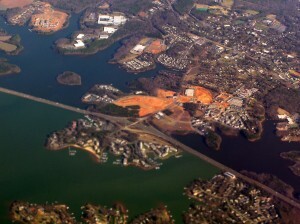 Lake Norman has not only changed the geography of the Piedmont, but has also influenced the area’s development, demographics, and identity. If you look at the Davidson town website, you will see images of happy, healthy people doing wholesome activities like biking and jogging. You might even see a couple photos of happy beautiful people drinking lattes from Summit or going to the farmers market. Although this reflects parts of Davidson’s identity now, the town did not always look this way. Davidson was a small rural town before Lake Norman covered much of the farmland and made the town a lakeside destination. In this project, we will look at Davidson’s development and subsequent identity changes, focusing in on the development of Griffith Street, the major thoroughfare connecting the town to Interstate-77.